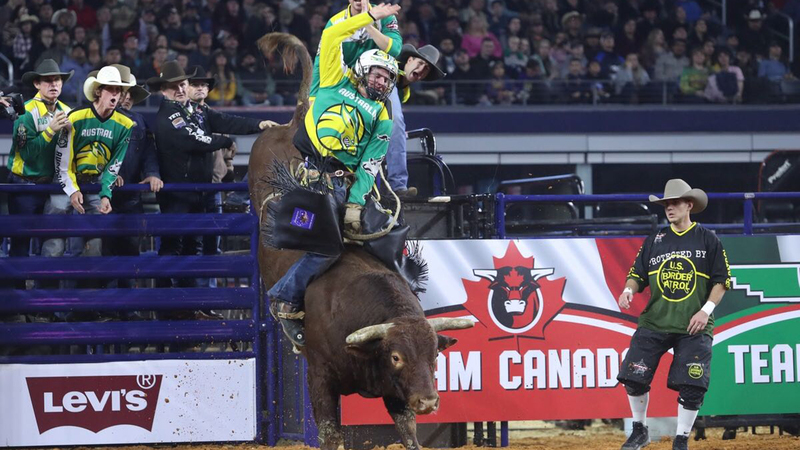 ARLINGTON, Texas – Reigning PBR Australia champion Aaron Kleier may not be ready to ride in the United States full time just yet, but Kleier showed his potential on Saturday night during the WinStar World Casino & Resort Global Cup USA, presented by Monster Energy. Kleier began things for Team Australia with an 82.75-point ride on Ol’ Boy. Unfortunately the Australians could not build off Kleier’s ride. They went on to conclude the night 2-for-9 with Lachlan Richardson being the only other Australian to reach the 8-second mark. Team Australia is sitting in fifth place and trails event leader Team Brazil by 426 points heading into Championship Sunday in Arlington, Texas. Kleier was bucked off by Night Sweats in 5.13 seconds in the Bonus Round. The 21-year-old has competed at all three Global Cups for Team Australia and is 3-for-7 at the international bull riding competition. This weekend is the first time Kleier has begun a Global Cup with a qualified ride. Kleier said he was not intimidated by the big stage that is AT&T Stadium. Fans can watch the conclusion of the Global Cup USA Sunday at 1:30 p.m. ET on RidePass. Kleier is the No. 12-ranked bull rider in the world standings courtesy of a victory at the PBR Australia event in Adelaide and then a victory at the Portland, Oregon, Pendleton Whisky Velocity Tour event in his United States debut. The Clermont, Australia, native does not expect himself to ride in the United States this year even if he is ranked inside the Top 30 of the world standings following Unleash The Beast cuts. Kleier said he may want to wait another two or three years before riding full-time in the United States. He also understands that if he chooses to not ride on the Unleash The Beast he could be suspended from the PBR’s top tour for a full year. Team Australia coach Troy Dunn has been happy with Kleier’s development for the past few seasons and says he understands Kleier’s hesitancy to come over to the U.S. right away. Dunn said he has yet to talk to Kleier in detail about his plans for 2019. “He kind of runs his own show and we want to get this event out of the way and just have him focus there,” Dunn said. “He takes things one step at a time. He wanted to win the Australian title (last year) and he did it. When I was his age, I was in the same boat. I wanted to win the Australian title before I came over to the U.S.
Another rising star in Australia may be getting to ride on the Global Cup stage Sunday. 2018 Australian Pro Rodeo Association champion Brady Fielder is the Team Australia alternate and he may be called into action due to injuries to Jason Mara and Justin Paton. According to Dr. Tandy Freeman, Mara is doubtful for Sunday after he aggravated a previous left hip adductor and abdominal strain during his 3.4-second buckoff against Hammer Harry. Fielder is 3-for-5 in two PBR events so far, including a 1-for-2 showing at last weekend’s Knoxville, Tennessee, Pendleton Whisky Velocity Tour event.